Is there an area in your house that you want to make look new again? Swapping out your old and damaged flooring with some new vinyl tiles may just be the answer! Vinyl tiles come in a variety of patterns and colors. There is such a wide range of colors that it is adaptable to fit into almost any environment. Not only do vinyl tiles look great, they are also water resistant and durable. It can be used in any area of a house! If you have kids or pets running around, vinyl flooring might be a smart idea. Vinyl flooring has a “wear layer” on top so it is more resistant to foot traffic than other flooring options. Since it is waterproof, it works especially well in kitchens, bathrooms, and wherever else water ends up on the floor. The installation of vinyl flooring is quick and easy. It is also very affordable. 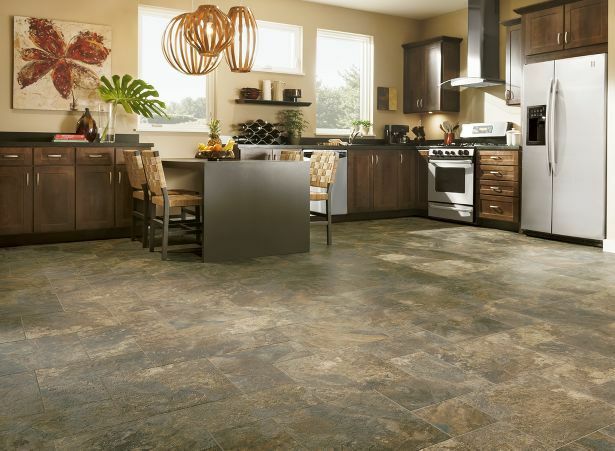 If you are looking to update your house’s style but don’t want to empty your wallet, consider vinyl flooring. We also offer durable sheet vinyl. Vinyl flooring has been popular in America for years, and there is a reason for that! If you want more information about how we can help you with your vinyl flooring, feel free to stop into our showroom and see the variety of options that vinyl can provide for your home.